Cabin 'Snowshoe' é maravilhoso aninhado na floresta, adorável construído pelos proprietários. Com duas histórias, criadas com muitos detalhes lindos, que o tornam aconchegante, você se sentirá como em casa. No primeiro andar, há uma cozinha, um ônibus Futon e uma excelente área de jantar. Mesmo que seja uma cabine seca, montamos um sistema de água corrente na cabine (água fresca fria) Construímos uma casa de banho moderna diretamente perto da cabine Água fria e um ótimo chuveiro ao ar livre (quente em 10 segundos) somente no verão. No andar de cima é um 'one of a kind' área de dormir com duas camas queen size até 4 pessoas. Nós fornecemos WiFi gratuito e ilimitado em nossa cabine. Eu forneço roupa de cama limpa e fresca para todos os hóspedes gratuitamente. A partir daqui, você pode assistir a vida selvagem ou as deslumbrantes auroras boreais nos horários de inverno. A cabine mobilada contém tudo o que você precisa para se sentir confortável. Você pode usar uma kitchenette com todo o inventário que você precisa. 2 placas de fogão, geladeira, torradeira, máquina de café, fogão a água quente, microondas .... panelas, panelas, talheres e muito mais. Existem algumas especiarias, café, chá e lanches para começar suas férias. Como nossa cabine está de pé em nossa propriedade, estamos sempre lá para todas as poucas necessidades. Aproveite o ar livre e obtenha a verdadeira sensação do Alasca do nosso excelente País e Natureza. Nós também oferecemos visitas guiadas durante todo o ano. Nossos clientes adoram surfista, raquetes de neve, pesca no gelo, diferentes tipos de Northern Light Tours, Círculo Ártico, Sightseeing e Chena Hot Springs. Para obter informações sobre nossos passeios, preços e muito mais, por favor, forneça seu endereço de e-mail quando você reservar. O check-in é das 15:00 h às 22:00 h apenas. Por favor, deixe-me saber sobre o seu tempo de chegada e partida mais recente um dia antes para que eu possa orientá-lo e check-out. Deixe a cabine tão limpa como você encontrou e não há taxa de limpeza. Caso tenhamos que limpá-lo, eu pago uma taxa de US $ 100. Eu quero fornecer-lhe uma cabine limpa perfeita. Tem a sensação do Alasca real com nossa dependência design moderno e maravilhoso chuveiro ao ar livre quente no verão. Diferentes Oportunidades Duche perto de nossa propriedade, especial nos meses de inverno. Nosso desejo mais profundo é o de proporcionar a você uma inesquecível Alaska Wildlife Adventure. Como vivemos na mesma propriedade, estamos sempre disponíveis para todas as suas necessidades. Vamos ajudá-lo a planejar suas atividades. Clean and cozy cabin. Love it! Thank Jutta and Rainer providing this lovely cozy cabin for us. It's very clean and wonderful. We stayed here for two days in March and we had everything we wanted. Jutta and Rainer were very responsive to everything. We were able to cook in the cabin and they have all the sauce and utensils prepared. The temperature in the cabin was just perfect. The bed was very comfy too! They even have a booklet to let us know what to visit nearby and all the details about staying in their cabin. At the last day, Jutta even let us check out a little bit late because we had the tour in the morning. We would love to come back again next time. Highly recommended! Scenic place at morning and night. They also provided a lot fun tours. It is a pleasure for us to meet guests from all the world. What a fun to show them why we live ALASKA, special our area so much. Thanks for being our guests and we would love to see you soon again. Thanks for booking our tours as well. Best wishes for you girls, you were wonderful guests. What a great little cabin with the true Alaskan experience! Our hosts were outstanding. Not only were they great and welcoming but also helpful with indicating awesome tours. I will be back for sure! It was a pleasure for us to have you and we are so glad you both loved it. What a wonderful combination Cabin and Tours in one hand, right. Hope to see you soon again and bring your husband as well. Best wishes from North Pole. My husband, daughter and I had a really nice time staying in this lovely little cabin. You can really tell that the owners put a lot of heart and soul into building it. We especially enjoyed the outdoor shower and could also tell that the outhouse was built and decorated to be as comfortable as possible and it truly did almost feel like a typical bathroom. Jutta and her husband were very friendly and hospitable. If we ever find ourselves near Fairbanks again we would absolutely consider staying at their property in the North Pole. We also got lucky and saw the northern lights just around the corner at Chena lake! It was a perfect getaway! Thanks for your wonderful review. We love it when we hear that our guests enjoy our property and our gorgeous nature. Thanks again and hope to see you soon again. This was the largest loft-style guest cabin we stayed in in Alaska. It feels, in many ways, more like a house than a cabin--as the walls are drywalled, and the downstairs space is quite large. Also, the "outhouse" isn't really an outhouse at all, but rather a full bathroom that simply doesnt have running water. Jutta and Raner change the receptacle every day, so there's no "outhouse smell," and there are nice soaps, etc. As we came in winter when it was negative thirty degrees out, we did not get the opportunity to use the outdoor shower, but it looked just as nice as the adjacent outhouse. Either way, there are showers just five minutes driving away that are just fine, in the event that you come during the winter. Lastly, both Jutta and Raner were very pleasant, and Raner has a nice operation with Alaska-Wilderness-Guide, with lots of opportunities for tours. We weren't able to go on one, but we did get a chance to see the price list and it looked very reasonable. They were very nice and accommodating, and willing to waive the cleaning fee after we left the place clean for them. 10/10 would recommend to a friend. We really enjoyed having you both. The biggest Thank you for leaving the cabin so nice and clean. Hope to see you again in one of our great summer. We had a great experience at "Cabin Snowshoe" - Jutta and Rainer were excellent hosts and made sure we were taken care of. The cabin was a great compromise between feeling like you are truly getting an Alaskan experience (i.e. not staying in a chain hotel) while at the same time not being too rustic for someone who isn't outdoorsy or a big camper. It was the perfect size for two, the loft was very cozy and comfortable. The amenities made it easy to cook, grill, reheat leftovers, or stock supplies to pack a cooler for a day trip. Our two suggestions to those planning a trip are to make sure you have an SUV, truck, or similar vehicle. Do not get a car. The road is very bumpy. But really, you shouldn't be getting a car anyway if you want to drive Denali Highway and other dirt roads, so this is also a general Alaska tip. The other is that the outhouse toilet seat can be cold, especially at night (we were there in late August/early September). A layer of toilet paper or paper towel on the seat does the trick, at least during that time of year - problem solved. After going out to see the northern lights two nights in a row (Murphy Dome then Ester Dome), we saw the best light show of all right outside of the cabin on the third night. It is a really great light viewing location! 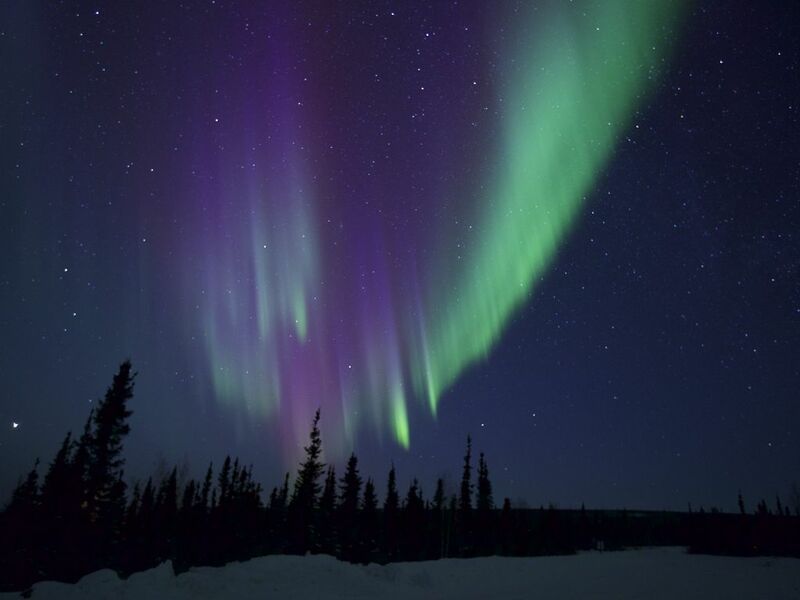 We enjoyed many other sights in and around Fairbanks, and if we get to come back in the future we will look forward to going on some of the trips offered by Jutta and Rainer like the Arctic Circle trip. We had an amazing time and give Jutta and Rainer our highest recommendation! Thanks so much for your wonderful Review and your stay at our cabin. We enjoyed the Time with you both aus well. It's such a fun to meet People WHO Love Alaska like wie do. And yes, the Northern Lights on our property can be gorgeous. Oferecemos passeios durante todo o ano. Tours guiados para os viajantes de nossa propriedade. Atividades no verão: Arctic Circle - Canoagem - Chena Hot Springs - Caminhadas - Pesca - Sightseeing - região selvagem do Ártico - Denali. Nosso desejo mais profundo é proporcionar aos nossos hóspedes uma experiência pessoal e exclusiva imersão na beleza do Alasca. Família de propriedade e operados. De Alto Nível sobre Segurança e Equipamentos Profissionais é o nosso padrão. Cancellation Policy is available by contacting the owner when booking. Smoking allowed outside the cabin. No pets please.i Additional cleaning fee $ 100.00 if necessary.Guests are responsible to leave a clean Cabin. Rates are for two persons, fee for any additional person $20.00/ per night and person. Guests are responsible for damages.